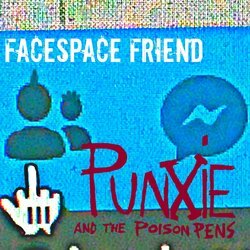 Punxie & The Poison Pens are a 4 piece pub rock act that has been playing around Brisbane and south east Queensland for many years, highlights of which have included supporting acts like Richie Ramone and The Anti-Nowhere League's Australian tours. Their first CD-EP Bad Girl achieved considerable praise but failed to trouble the charts - now working in their dedicated studio and after a few false starts - at last the very long awaited next releases are starting to come out, and the results are fresh and impressive. The best 2 minute filler song ever from your new favourite band. Upbeat, cheerful, modern. Hard drums, wailing guitars, and a Courtney Barnett style female vocal.